I recently purchased an Ernest single-slot payphone on Ebay. I have all the keys. I have been unable to find any information about programming the phone from the keypad. 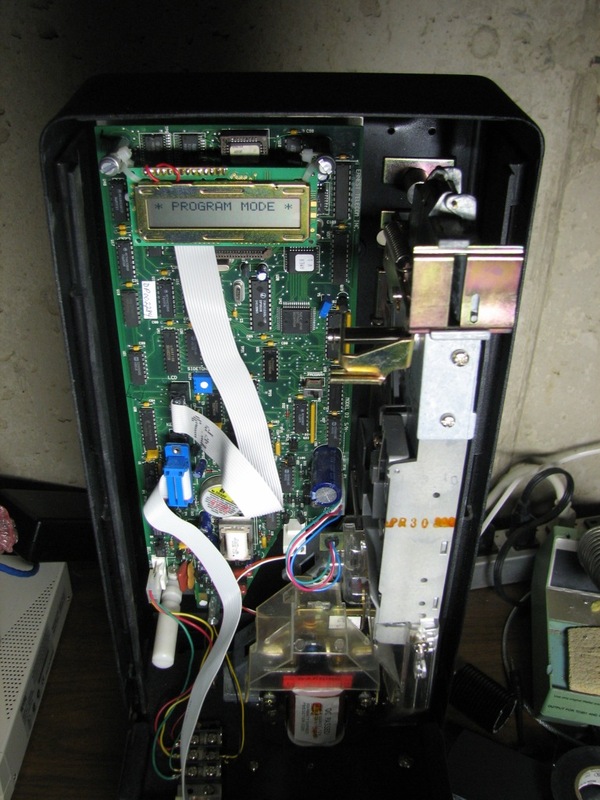 There is a slide switch on the main board marked "Program/Run". In the "Program" position, the keypad is active and plays tones, but no voice prompts or any other feedback is heard. The board revision is "D3". I've done a thorough Google search and come up empty. Does your D3 have an LCD readout near the keypad on the front? If not, does it have a serial port on the main board inside? I've got the Ernest ETX and I know how to program it from the keyboard. You need a specially wired serial LCD connected inside to the main circuit board via a 16-pin ribbon connector (if your phone doesn't have an LCD display on the front.) Let me know the LCD situ with your phone. There are literally dozens of parameters which can be set from the keypad. If nothing else, try connecting to it via modem. Chances are, you might actually get something intelligible spit back at you. Even if it isn't, post it here, I think all of us are interested . It does have the LCD connector, but no LCD didplay. I managed to locate the documentation, etc. needed to program the phone. It would be great to have the LCD available to make quick changes via the keypad. Thanks for ideas for wiring that up myself. The phone seems very full-featured! BTW, the 2-digit codes used for the Protel COCOT boards are very different than the two-digit codes used on this payphone. You hooked it up to the phone againt, didn't you?! A kind individual sent me instructions for wiring up a 14-pin parallel 16x2 LCD display. These things are < $5.00 on Ebay and very common. I used a cut-off IDE cable to connect to the board. It worked perfectly! I can now program from the keypad. 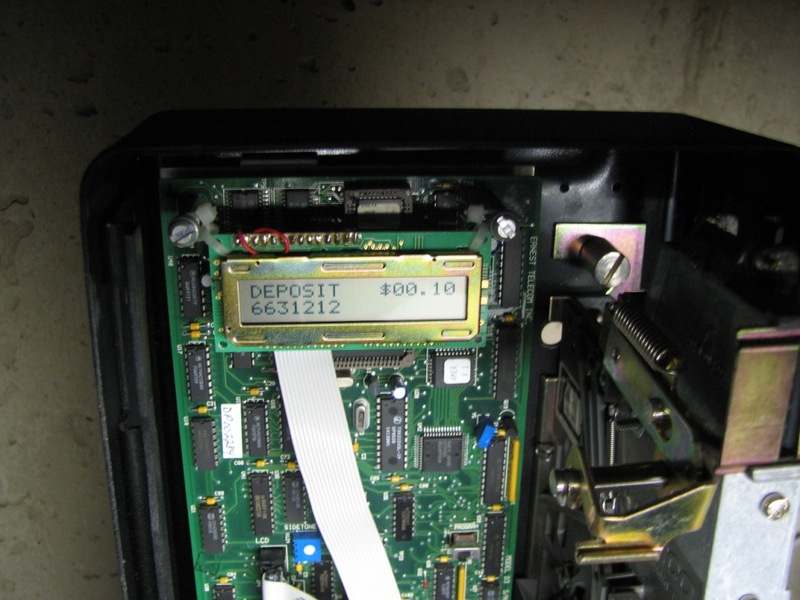 In normal mode (program switch in normal position), the display even shows how much to deposit, amount deposited, and overtime credit. I mounted the display inside the phone. Another kind individual sent me the TeleLink software to program the phone with a 1200 baud modem. This also worked perfectly, although I had to play with initialization strings to dumb-down the modem enough to work. The software .zip file had the phone manual included, with the keypad programming instructions! BTW, Ernest is still in business as a payphone service provider, but no longer makes the phones. I spoke with them on the phone, but they have no interest in supporting the software or phones. Using the programming tools, I was able to override the out-of-date rate table in the phone and set up my own rate structure. I have it connected to an ATA adapter into my ProjectMF Asterisk box. The phone itself is in my home hallway, as a second line for the house. I had to replace a cracked coin totalizer switch ($10.00) and soldered in a new lithium backup battery ($8.00). Much fun! I like blueboxing over projectmf from a payphone. Really adds to the experience! I have also come across an Ernest payphone, with the ETX board. I have looked high and low on the Internet for the Pinout of the LCD header. It looks like df99 had found it, but It also looks like he hasn't been on in awhile. Anyone know where I get ahold of the programming manual, or at least the pinout of the LCD connector? The ETX and D3 boards are very similar. An LCD module is wired identically for either model. I used an old IDE disk drive connector cut off to fit the 14-pin connector, handwiring the LCD module. I mounted mine inside the phone and leave it connected all the time. I also had to wire the contrast bias pin on the LCD to the +5 volt line to get acceptable contrast, rather than use a pot. YMMMV, depending on the module type used. The board provides power for the LCD. Mine has been connected for years to my Asterisk system and is still working fine. Drop me an email at bluebox@projectmf.org and I'll send you the manual and programming software. If you don't want to wire the "proprietary" LCD connection by hand-soldering, you can get a 14-pin IDC dual-row connector, crimp it to your cable as usual (pin 1 == pin 1), and solder it to the other side of the board with the pin 1 stripe in the same direction as it would normally be. This effectively switches pin 1 with 2, 3 with 4, et c. Obviously, this only works if the LCD module you get uses a 2x7 dual row connector, rather than a single 14-pin single row connector. I hadn't though of that. Great idea. However, my LCD module has all 14 connections in a single row, so not an option in my case, as you mention. I am really glad I found this discussion, it helped tremendously on trying to figure out how to program my Ernest ETX. I could not find a 16x2 LCD on Ebay with just 14 pins. Most 16x2 LCD displays now have 16 pins. The extra 2 pins are for powering the LED back lighting. Pin 15 is 5VDC + and pin 16 is 5VDC -. This point is almost useless in my case as the PCB on the phone did not supply enough power to drive both the LCD and LED back light at the same time. I could not get anything to function properly until I disconnected the power (pin 15 and 16) to the LED back light. As far as wiring the contrast (terminal 3 on LCD) I tried using a jumper wire from pin 2 (5VDC +) to pin 3 (contrast) and I was never able to distinguish anything appearing on the LCD. I also tried it with the wire disconnected and with it just wired to the IDE connection on the phone PCB, no luck. I then tried wiring a 10k Pot with one side to pin 2 5VDC+, the other side to pin 1 (5VDC-) and the center terminal to pin 3 (contrast). At this point I could adjust the contrast to clearly read the LCD display. The pins on the 16x2 LCD were clearly marked but I was unsure of the pin configuration on the phones PCB where the LCD plugs in. This is as you look at it on the phones PCB board with the phone standing up in regular position. I hope this helps anyone looking for it. When I started this project I was told I could not run the pay phone off a voip system. That is not true, I am currently running this from an Ooma voip box. I had to connect a GE wireless phone jack system with the master connected to the Ooma Telo, and the slave unit connected to the Pay Phone. It seems the GE wireless phone jack system reproduces the old landline voltages much more accurately than the Ooma Telo Voip box. If anyone has any experience in programming the Ernest ETX I would appreciate some guidance. I would like to program the phone so all calls are free (it will be mounted inside my home). It would be even better if I could program it so the caller had to place a quarter in the phone but it was returned when the handset was replaced and call ended. I have been through the programming features and have not figured out how to achieve this.